On September 8, 2014, McDivitt Law Firm opened the doors to an additional Colorado Springs office at Powers and Stetson Hills. The new location is designed to better serve clients in the Northeast part of the city. Mike and Karen McDivitt started what would eventually become McDivitt Law Firm in 1974, built on the philosophy that everyone should be able to have an attorney, whether you can afford one or not. Over the past several decades, McDivitt has become one of the largest Personal Injury law firms in Colorado. 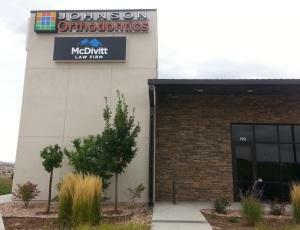 McDivitt now has four locations serving clients in Denver, Colorado Springs, and Pueblo. In every office clients visit, they are guaranteed the same quality experience each time. The McDivitt Team, of nearly ninety members, thrives on serving the needs of its clients through caring and aggressive legal service. As the firm grows, McDivitt continues to reinvest in Colorado with the additional office and the expansion of the firm’s community outreach. McDivitt invites its new neighbors to visit this most recent addition at 5850 Tutt Center Point. McDivitt Law Firm is a Colorado-based law firm that has been providing legal representation to injured victims and their families throughout the state of Colorado for the past 40 years. Founded by Mike and Karen McDivitt, McDivitt Law Firm has an experienced team of lawyers, paralegals, and support staff who provide their clients with caring and thorough legal service. Visit McDivittLaw.com to learn more.